Two stories came out in today's Evening Standard of London that involved abuse within arranged marriages. The first involves 19-year-old Sabia Rani, who was murdered by her new husband Shazad Khan, 25, last year (both are shown in this picture). The trial against Khan is currently underway, and the brutality with which he killed Rani is nothing short of horrifying. The hard kicks, stamps, and strong punches inflicted on Rani created, in the opinion of a pathologist, "injuries similar in severity to those suffered by someone in a serious road accident." Khan's mother, two of Khan's sisters and one of their husbands are also being blamed for failing to help Rani, who was not allowed out of her home in Leeds without a member of her husband's family. Born in Pakistan, Rani had only been in England for five months at the time of her death. The second story is of Shafilea Ahmed. 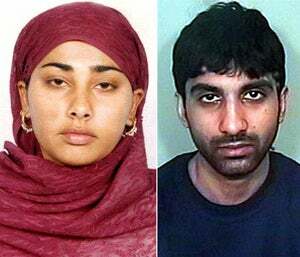 Ahmed had disappeared in 2003, four months after she returned to England from Pakistan. Her family had gone on a trip to introduce Shafilea to her arranged husband-to-be. Shafilea was less than pleased, and drank bleach while in Pakistan. (No reason was given but it is assumed she was trying to kill herself). She went missing in September of 2003, and her body was found in the River Kent in February, 2004. Her death is making news again because an inquest has shown that Shafilea did not die of natural causes — she was either smothered or strangled to death before being dumped in the river. No one has been charged with anything as of yet, though Shafilea's death is still being investigated.